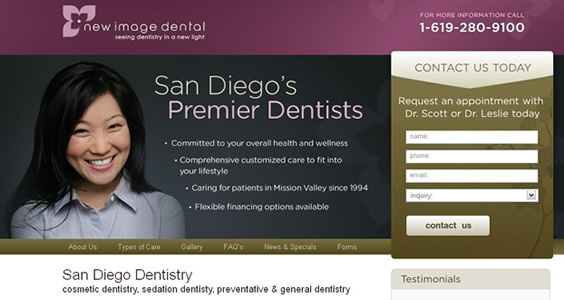 New Image Dental came to Ninthlink for a site redesign to give their site a more modern look while encouraging improved lead generation. Already an active participant in search engine optimization (SEO), we decided to use a proven on page tactic to further increase the likelihood of a conversion, in this case a phone call or contact form submission. To accomplish this we have our ‘Contact Us Today’ form in the same, prominent position above the fold on each page of the site. Just above the form is the phone number, which assures users their is someone available to offer assistance or answer any questions a they might have. Just below our Contact form is a strategically placed testimonial, a great credibility building element, which is always important to have close to a contact form. One more important thing to note is the simplicity of our form; the less fields you have, the more inviting and easier it is for site users to fill out. In our version we capture a name, email, and phone- all that is needed for that important lead. For a fresh looking site, or ideas on how you can improve your conversion rate, contact Ninthlink today.